Blog - Google Street View for South Africa Finally Here. Google Street View for South Africa Finally Here. In late 2009 Google announced that it was going to produce Street Views of the Major South African cities. 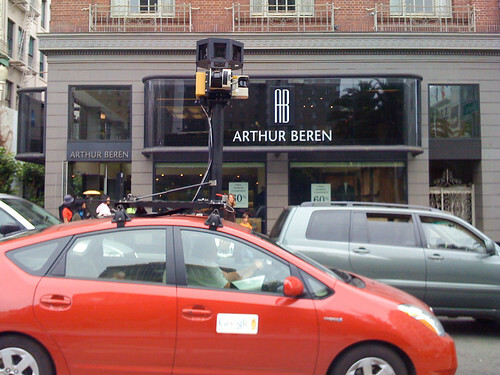 Since then many people have tweeted seeing the Google Camera Prius’ riding around the country. Well it’s finally here, 08 June 2010, Just in time for the FIFA 2010 World Cup. The initial announcement Google said that it was taking photographs of locations in Johannesburg, Pretoria, Cape Town, Port Elizabeth and Durban. Google Street View is the integrated 360° panoramic view of images taken at street level. It is integrated into both Google Earth and the online Google Maps services. Google Street View displays images taken from a fleet of specially adapted cars. On each of these vehicles there are nine directional cameras for 360° views at a height of about 2.5 meters. Google Trikes are also being used for the first time to map popular tourist destinations, such as the scenic Chapman's Peak Drive and Table Mountain in Cape Town, Soccer City in Johannesburg, and the new Moses Mabhida Stadium in Durban. If you haven't had the pleasure of seeing Google Street View in action, then take a look at some of the samples below. It really is exciting and phenomenal. My House in South Africa. We are all very excited as South Africa becomes part of this great mapping technology. I’m sure we can all benefit from this. No more trying to figure out what that landmark might look like when reading directions. Now you can actually walk your journey through on your PC before you start. Being well prepared for the journey, no more late meetings or “Help I’m Lost” messages. Have you played around with Google Street View yet? What are your thoughts? Re: Google Street View for South Africa Finally Here. I used street view to find which end of a curvy road my friend's house was on. She said to look for the white fence. Street view saved me a couple kilometers of dangerous road at night. Very helpful when given visual landmarks.